Thematic Network Interactive Intelligent Systems (funding period 2015–2018) is made up of six highly respected partner institutions from around the globe. The overarching goal of this Thematic Network is to establish permanent international research cooperation at the educational and scientific levels, with a focus on providing young academics with an interdisciplinary research-oriented program of study, which will help prepare top talent for employment in high-tech and technology related fields. Coordinating research by identifying joint research projects and publications. 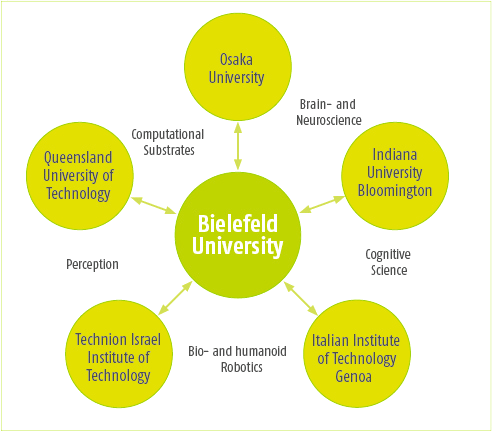 Coordinating education by organizing and offering workshops, the annual Summer School in Bielefeld, guest lectures, and structured doctoral education programs. Bringing together and sharing expertise by, for example, instituting a Lab Rotation Program, data management, remote experimentation, and a virtual lab toolkit. Through intensive exchange, the experts in this network are working together to help innovate cutting-edge designs for the intelligent systems of our future. The Thematic Network Interactive Intelligent Systems is supported by the German Academic Exchange Service (DAAD) and sponsored by the German Federal Ministry of Education and Research (BMBF).